Recently we were invited to a dinner at the lovely Mai Kitchen Vietnamese Restaurant. The restaurant was warm and welcoming, as we were surrounded by wooden interior design and furniture. Keeping within this theme, the menus showcased a wooden aesthetic. Coming out of the chilly cold night and into the warm restaurant was a blessing! We opened our menus to find a sea of options, absolutely spoiling us for choice. From chicken to beef and seafood to vegetarian, it's safe to say we had trouble deciding. To make it even more difficult, they have a menu dedicated to vegan options! The prices are a down right steal to say the least, cheaper than any restaurant you'll find in town and the food is oh so authentic you feel like you're on the streets of Vietnam. The friendly waiting staff recommended and highly encouraged sharing meals, constantly remarking "the sky's the limit!". To our delight, they were right. Though after ordering an entree, three main courses, rice and two desserts to share... the waiters questioned our extravagant choices with raised eyebrows. Specifically made at our request, we indulged a little more with some cocktails. Known as part of Mai Kitchen's hidden cocktail menu, the staff were more than happy to make Vietnamese style cocktails as we asked for them. We sipped on a lovely mango infused Miss Saigon cocktail, feeling like we were on a beach far far from Adelaide shores. We also sampled another version of Miss Saigon called Happy Saigon, reflecting a Vietnamese sunrise on a hot day with pineapple flavours. Finally, we had the best Espresso Martini, made with Vietnamese coffee and condensed milk. This cocktail woke us up in all the right ways being It as velvety as a frappe from the Greek Islands and smoother than James Bond jumping out a burning helicopter. Miss Saigon, gone, gone down the hatch. Caution with this dish, please share it with anyone who loves rolling stuff and authentic Asian flavours. Do not eat this solo, unless it's your main, cause it's a biggie. The Viet-style pancake is folded over with bean sprouts and onion inside, with your choice of Chicken, Pork & Prawns, or Vegetarian. You cut some of the pancake off and wrap it inside a lettuce leaf with some mint, and dip in the delicious fish sauce. Who knew eating could be so much fun? The pancake setup, told you it was big. So chicken. Much veges. Very health. 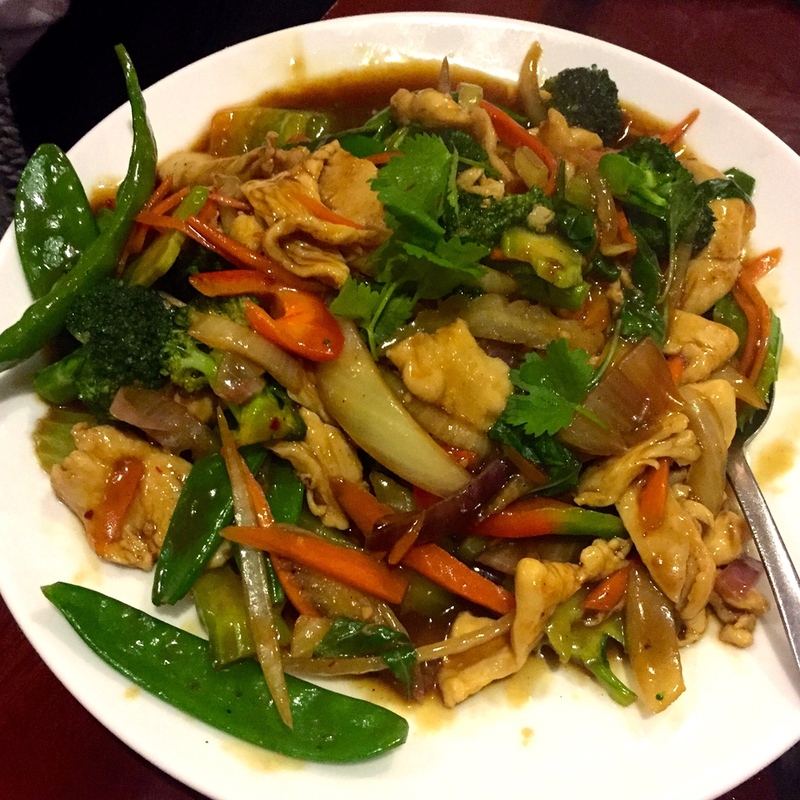 The Basil Chilli Chicken was a solid dish, cooked to perfection and tossed with a number of vegetables. The sauce was lovely and gave the best Thai basil flavour, without being too spicy. Another huge serving, no wonder they encourage sharing. If you love a good satay sauce, this beauty is for you. The sticky peanut sauce on the tenderly cooked beef was to die for. This one was so delicious we cleaned the plate, and went down a treat with some freshly steamed rice. A personal favourite for the night. For someone who's not a huge eggplant fan, this was pretty damn amazing. The eggplant was crispy and hot on the outside with the lightest (and tastiest) sliced eggplant to hit these tastebuds. This serving was a great size for a main, but we would recommend ordering something on the side if you're hungry. This came out looking like a large arancini ball on the outside, served hot and crispy with cold ice cream on the inside. You can choose from caramel, chocolate, or strawberry sauce, making this dessert a great way to finish your night. To be enjoyed with unbuttoning pants and good company. Who knew spring rolls could be such a great concept for dessert! We certainly agreed with the combination of warm banana and Nutella mixture encased by crunchy spring roll pastry and accompanied with strawberry sauce and cream. Two spring rolls are served and dusted in a cinnamon/icing sugar mixture, a dessert you wouldn't want to share with anyone else. Check out the Mai Kitchen Facebook page here. The website will be up shortly, but for now the menu is available on the Mai Kitchen Facebook page. If you're tired of your regular Asian cuisine joint we strongly recommend Mai Kitchen, located at 34 Wright Street, Ferryden Park just off Ridley Grove.